So you’re getting married. Tying the proverbial knot. The date is set, the venue has been chosen, and the honeymoon sits patiently, waiting for you—the cherry on the wedding sundae if you will. Invites are out and seating arrangements have been painstakingly and meticulously set so as not to offend or provoke dramatics. Organizing a wedding is a massive undertaking—even the details have details. Most impending spouses don’t truly realize the extent of the decisions that must be made until they are lost within the swirling tornado of their forthcoming nuptials. Even the best of planners often wilt a bit under the pressure of planning a wedding—especially planning a wedding in or around New York City. The stress of this seminal event is ever-present and undeniable, so any alleviation of said stress needs to be embraced. Enter: Bermuda Limousine. Choosing Bermuda to chauffeur you to and from your big day is a decision that will alleviate your stress rather than add to it. Whether a single limo is needed for you and your soon-to-be spouse, or an entire fleet for the respective wedding parties and families—we can tailor our services to fit any request. And our services reach far beyond simple transport, we provide complete on-the-ground logistics to ensure every detail is in place at all times. We will coordinate with the venue about parking so you don’t have to; it’s our job to make your life easier, not harder, and we take that responsibility very seriously. We will go over the entire itinerary and passenger list in great detail so you can be assured we know exactly who needs to be where, when. When you bring Bermuda Limo on board for your wedding, you can breath easy in the knowledge that you’ve chosen a teammate who wants to make your planning—and thus, your big day—easier and infinitely less stressful. Bermuda Limo doesn’t settle for basic cars and untrained drivers. Our chauffeurs are exceptionally polished and professional and will set all your guests at ease. They know New York City like the back of their hands and will keep everything running like clockwork. All our drivers are highly trained (attending classes twice annually) so you can fully trust in your decision to put your wedding transportation in their hands. Our luxury limousines are all Wi-Fi enabled so any last-minute changes can easily be made. In addition, each of our vehicles are equipped with GPS-tracking so every member of the wedding party can be located at any time. Technology aside, you would be hard-pressed to find a fleet that is more luxurious and better cared for than ours. We own our entire fleet of vehicles and are relentlessly meticulous in their upkeep in order to ensure they are all in perfect working order, and are fitted with the most comfortable interiors. Your drive from ceremony to reception to hotel will be remarkably peaceful and serene and provide a welcome respite from the chaos of the day. Weddings are rife with an immense amount of inherent pressure and stress, so don’t let your wedding transportation add to the pandemonium. 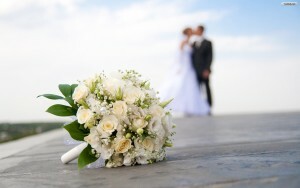 At Bermuda we recognize that each wedding is its own entity onto itself and deserves to be treated as such. You shouldn’t have to worry about every detail of the day as it’s occurring; you deserve to take a deep breath and enjoy one of the most important days of your life. Not all chauffeured limousine services are created equal; give us a call today and find out what sets us apart and how we can make your wedding day an easier and less stressful experience.